What is the one thing we do that has the greatest impact on our lives? The answer: the decisions we make. This question, or a variation, is one that comes up frequently in discussions with clients and is one I have long wrestled with. Having given my response to this question numerous times, the answer appears to be self-evident in that I cannot think of anything else we do repeatedly that comes close to addressing this question. The decisions we make forge our life path. This means there are no small inconsequential decisions, ever. Think about it, every new day begins with a decision. The instant we wake up, we make the first one of the day; a decision that may keep us in bed, guide us back to sleep, or compel us to get up and get going. Between the time of that first decision and the final one of the day before we drift off to sleep, we will make hundreds, if not thousands, of other decisions. Making decisions most often precedes taking action. When we are trying to make changes and battling with the inner forces of resistance, the decisions we make determine one thing: whether our actions are guiding us towards, or away from, where we want to be. The real issue is that we frequently fail to recognize that we are where we are today largely because of the decisions we have made in the past, and the decisions we make today are laying the foundation upon which tomorrow will be built. What this means is that everything counts. Everything. Compound this with the frequency with which we delude ourselves into thinking that a brief deviation from our plan will have little effect, and we can easily end up setting ourselves up for future disappointment and/or regret. Experts tell us that regardless of the indisputable facts that may be in front of us, the decisions we make, while certainly influenced by those facts, are even more influenced by our emotions which frequently convince us to take actions that defy the evidence before us. Nowhere is this more evident than in the regular weight-loss workshops I deliver: all attempts at weight loss begin with a decision to do so. This decision is often followed by a strong determination, “This time I will really do it” and, for most, for the first little while we stick closely to that commitment. 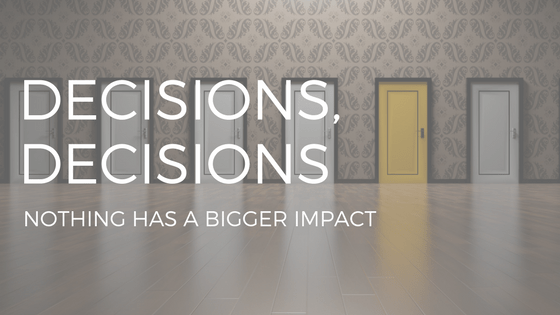 Not only are we talented at making decisions, we are particularly skilled at rationalizing to ourselves why it is okay to go ahead and make decisions that will push us further away from where we want to be. So, when we are presented with an enticing opportunity to deviate from our chosen method of losing weight – “that chocolate cake sure looks and smells delicious” – we frequently decide to enjoy the chocolate cake because we simultaneously decide that we will somehow make up for it the next day by doing something which, if we are to learn from the lessons of history, we know we won’t do. Successful and sustainable weight loss can only happen by training ourselves to make new, different and long-lasting decisions around our nutrition and physical activity. This requires an initial decision to commit to acquiring a whole new mindset and then making another decision to stick with it. Our ability to sustain permanent change is governed far more by the decisions we make than by our capability of doing so. Remember this: nothing happens until we make a decision. If we are serious about implementing personal change, then the best possible decision is to make that decision right now. And then make the decision to stick with that decision.